The 2014 District 18-6A football title was shared by three teams, Aldine ISD’s Davis High and Eisenhower High and Memorial High of Spring Branch ISD. Each team beat one another in key games to force the three-way tie, and so it would only be natural to name Davis High head coach James Showers and Eisenhower High head coach Kerry Bamburg as the Northeast News’ Co-Coaches of the Year. Showers helped lead the Falcons to a share of the league title and a playoff berth in their first year of varsity football (the school opened in 2012 and played a junior varsity schedule its first two years), while Bamburg led his team to eight victories in his second year as the Eagle’s head coach after serving as an assistant coach/defensive coordinator for 15 years at Aldine High School, his high school alma mater. After playing for legendary Aldine High head coach Bill Smith as a linebacker and defensive end, Bamburg attended Texas A&M University where he earned his degree and spent time around Aggie coaches and athletes who encouraged him to remain in athletics. He’s glad he took their advice. Bamburg began his coaching career in 1995 at Aldine High School working for Smith as a defensive assistant. In 2005, he moved to Caney Creek High School where he served as defensive coordinator and then moved to Smiley High School in from 2006-2009 to serve as the school’s assistant head coach/defensive coordinator. He returned to his roots in 2009 to serve as Aldine High’s assistant head coach and defensive coordinator before being named Eisenhower’s head coach in 2013. He said playing for and working under Smith was the best experience a young coach could ask for. 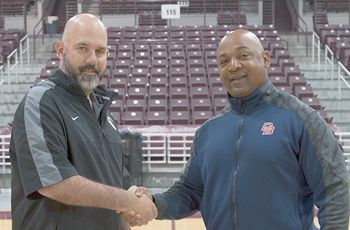 In addition to learning from Smith, perhaps the most successful coach in Aldine ISD history and the winner of more than 200 games and the 1990 Class 5A state championship title, Bamburg also credits former Eisenhower High head coaches Pat Patterson and Richard Carson and Aldine ISD Director of Athletics with having a profound influence on his career. Bamburg said he enjoys coaching because it affords him the opportunity to reach out to young men. “Coaching provides a great opportunity to influence, develop and impact the lives of young men each and every day,” he said. He said he was proud of what his team accomplished during the 2014 season and looks forward to many more successful years at Eisenhower. Bamburg and his wife Carrie have a daughter Michelle and a son Keegan. Showers did not see himself as a coach when he graduated from Sul Ross State. He wanted to go into law enforcement or business, but was persuaded to serve as a student assistant at his alma mater. Twenty-five years later, he’s still coaching and loving every minute of it. Showers played defensive back at Sul Ross State University and after three years as a graduate assistant, he served for two years as the head football coach at Sierra Blanca High School, then spent five years at Fort Stockton High School as an assistant coach and head track coach before moving to Shoemaker High School in Killeen where he served as the school’s assistant head coach and defensive coordinator for 12 years. In 2012, he was provided with the opportunity to begin a program from scratch when he was named Davis High School’s first-ever head football coach. Showers said his most influential mentor was his former coach Ken Gray. He said when Coach Gray spoke, he listened and learned much from him. Showers said it’s important for a coach at any level to gain the trust of his players. Once that trust is established, good things will follow. Like they did for the Falcons during the 2014 season. After a slow start, the Falcons got things going in district play and picked up a key win over Eisenhower to secure a playoff spot. Showers said he enjoyed this year’s team and is looking forward to bigger and better things in the future at Davis. Showers and his wife Shauna, who is an assistant principal at MacArthur High School, have a son and a daughter. Their son Jameill is the starting quarterback for the University of Texas El-Paso and their daughter Hailee was a multi-sport athlete at Nimitz High School. She currently attends Navarro College in Corsicana on a volleyball scholarship and is considering offers from the University of Houston, Arkansas, McNeese State, Texas A&M Kingsville and Midwestern State University. During the December 16 Board of Education meeting, AISD Trustees appointed Mr. Paul Shanklin to fill the unexpired term of Dr. Alton Smith, who resigned from the Board in November after being elected to the Lone Star College Board. The recommendation was made by the Board’s Nominating Committee, which was chaired by Dr. Viola M. Garcia. Fellow Trustees Steve Mead and Dr. Smith also served on the committee. 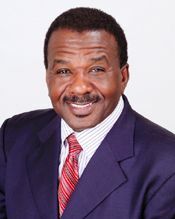 Mr. Shanklin is an attorney and an adjunct professor at the Houston Community College Southeast Campus, where he teaches American and Texas Government. He is also an adjunct professor at the University of Houston-Downtown where he teaches Critical Pedagogy and Multicultural Education. He has volunteered in Aldine schools and has been a resident of the Aldine community for 25 years. Mr. Shanklin will be sworn in at the January 13 Trustee’s meeting.